"Wally Berg organized and led a top-notch expedition. I would recommend him without reservation to anyone thinking of taking a trek or climb." Everest is still the ultimate summit for any mountaineer. The accomplishment of standing on its apex is not diminished by recent popularity. No one can climb Everest for you. Despite what some believe, terms such as “short-roping” do not apply. This is a mountaineer’s climb, demanding skill and self-awareness. Our team will take on this challenge in a competent and focused manner, using the collective experience of elite Sherpa high-altitude mountaineers under Wally Berg’s leadership. We will approach the climb with all the dedication, humility and organization necessary to succeed on the highest summit on Earth. Each of our team members will benefit from the same level of support and equipment, and each will have the goal of standing on the top of Everest. We do not believe in the “tiered” pricing for various categories of team membership that has become the hallmark of the strictly commercial expeditions to Everest in recent years. Berg Adventures is the only company to readily offer fall expeditions. The notion that Everest cannot be climbed in the fall is a relatively recent one. Wally Berg noted that when he first climbed Everest in October 1992 there were 7 different expeditions on the mountain and 36 people reached the summit between Sept. 25 and October 15! In the past few years when we have gone in the fall we have had the mountain to ourselves. See our archived dispatches, including the exciting account of Kit Deslaurier’s ski descent of Everest in October 2006. Proper preparation and organization are the keys to success on Everest. We have the time and expertise to make your Everest dream come true and we are readily available to help you navigate along your road to the top of the world. If you are serious about climbing Mount Everest, contact the BAI office to discuss a strategy that will get your training and plans headed in the right direction. If Everest is something that you’ve always dreamed of, but you don’t know if it is for you, we would love to discuss your options. We can help you answer the questions you may have: Is Everest right for me? What relevant experience do I have? What should be my next step? At over 29,000ft/8,840m, Everest requires climbers to have a very high level of fitness. Begin training for the expedition as early as possible before departure to ensure that you are in top condition. Overall fitness, with a focus on increasing endurance, is important to your success. Running, fast walking, swimming, cycling, soccer, basketball, and other sports can be ideal for aerobic training. You will want to practice hiking with a weighted pack (approximately 40lbs), going uphill as much as possible. Weight your pack with jugs of water during training ascents. By dumping out the water before coming down, you can reduce the strain on your knees. Everest is extreme, but it can be a surprisingly pleasant place to camp and live during the spring and fall seasons when we will be there. Life at base camp is simple, but you will be well cared for by the best cooks and support staff around. That said, weather conditions are highly variable on Everest – from warm, sunny days to cold, windy and snowy ones. Experience camping at high altitudes and in low temperatures is necessary before you go because it teaches you how to adjust your gear and manage your body temperature. Selection of the proper equipment for climbing and camping on Everest is imperative. We are happy to help you find the gear that will best protect you from the elements and will help you manage your clothing and gear for the expedition. 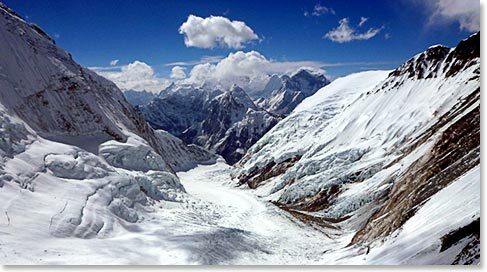 Everest is uncompromising, but if you are well prepared you will surely appreciate how spectacular it is.